At this point, only a willfully ignorant person would claim that the MTA should not be rescued. Just a few weeks before the MTA is set to jack up fares and start cutting services, the MTA announced a higher-than-expected deficit for 2009. The future is not rosy. Meanwhile, Albany remains deadlocked and on vacation. Some Senators won’t support tolls; others won’t support taxes; and as a NY Magazine graphic showed, nothing is going anywhere in the Senate. This stalemate, though, isn’t for a lack of trying on behalf of the transit supporters. In an effort to bridge some of the gaps in the Senate, Richard Ravitch, the architect of the tax-and-toll plan aimed as spreading the pain around, unveiled an amended plan that reduces some toll burdens in exchange for a few other fees. Still, the same old reactionary state Senators refuse to support a plan. Still, they pretend as though driving and tolls — and not a fully funded transit system — is some populist cause. It’s frankly getting embarrassing and angering at the same time. To pay for the rebates, the state commission proposed two additional charges: a 50-cent surcharge on yellow-cab rides and an increase in the Manhattan parking garage tax. Those additional charges would raise an estimated $150 million a year. The compromise was intended to overcome the objections of half a dozen Democratic opponents of the toll measure who have blocked the rescue plan in the State Senate, where Democrats hold a 32-to-30 margin. Senate Republicans have so far refused to support the plan and have said they have been left out of discussions. What Neuman doesn’t say is that this compromise, crafted to address a lot of the pro-business concerns, is also aimed at attracting Republican support for the MTA. It should work; it needs to work. But the same old politicians are at it again. We already know what the reactionary Taxi Workers Alliance thinks about this proposed plan. They won’t like it, but the real problem are the State Senators. Glenn Blain and Pete Donohue tracked down some of the more colorful and off-putting quotes from the Gang of Senate Idiots who won’t support an MTA funding plan. Again, we have Senators from districts that rely overwhelming on mass transit — about 70 percent of Diaz’s and Espada’s constituents commute via subway — who are resorting to faux-populist arguments. At least the TWA’s position is somewhat defensible. Espada, Diaz and Kruger are simply showing why they should never have been elected in the first place. When transit fails in the city — and it will if no funding plan is implemented — those are the men to blame. Pro transit advocates have done everything they can, but if they can’t convince the blind gatekeepers, we’re all lost. Yesterday morning, as the MTA Finance Committee prepared to deliver a shocking vote on fare hikes and service cuts, The New York Times ran a story on the Ravitch Plan’s East River bridge toll package. This was not your typical article on East River tolls though. Rather, it highlighted the views of the few and promoted them as though they were accepted wisdom among straphangers. But interviews with residents in these districts revealed that the holdout legislators have tapped into a concern shared by many of their constituents, even among those where it might be least unexpected: transit riders. And while toll opponents made up a spirited minority among straphangers interviewed in recent days, their views stood out, because they were both unexpected and passionately held. In the Soundview section of the Bronx, John Garcia, 33, a plumber with a job in Manhattan, is represented by Senator Ruben Diaz Sr., another vocal toll opponent. Mr. Garcia said that even though he was a regular subway rider, he worried about the effect of tolls on the small businesses that frequently use the Harlem River bridges. “Tolling the bridges is going to hurt a lot of people that own plumbing companies, construction companies, cabs, deliverymen,” Mr. Garcia said, adding that he would prefer higher subway fares to new tolls. While straphangers who opposed tolls were in the minority of those interviewed, far more common in the interviews last week were transit riders who feared the looming fare increases and supported bridge tolls. Isn’t, then, Neuman’s piece a bit of disingenuous and dishonest reporting? Isn’t the tale here really that the vast majority of straphangers support bridge tolls because they rely on the subway far more than they drive? Isn’t the tale here one of a disconnect between New Yorkers who need the subways and the out-of-touch State Senators sitting in Albany? Neuman’s story is helping no one and is simply distorting the truth. It’s another dismaying sign that the small minority of people who oppose bridge tolls and the Ravitch Plan have won the PR war at the worst of times. Twenty two days isn’t a very long time, but that’s all the state legislature has left if they want to save the MTA — and New Yorkers — from massive MTA fare hikes and service cuts. Meanwhile, storm clouds are gathering in Albany for an epic fight over the fiscal future of transit in the New York City Metropolitan Area. On one side is Sheldon Silver and his version of the Ravitch Commission recommendations. He supports the payroll tax and East River crossing tolls, but instead of the $5 fee Richard Ravitch proposed, Silver wants to start things off with a $2 fare, even with the current subway rate. It won’t stave off the inevitable cuts and hikes, but it’s better than inaction. On the other side is, well, everyone else. Some of Silver’s fellow Assembly representatives and some State Senators are decrying the toll plan on the same old populist line. These tolls will somehow hurt middle class New Yorkers. Those are, by the way, the same middle class New Yorkers who don’t own cars, don’t drive back and forth to work each day and do rely on the subways, buses and commuter rails to get around the region. When someone in the media will tell representatives such as Adriano Espaillat, Rory Lancman and Jose Peralta that, I do not know. Also on the agin’ side is Comptroller William C. Thompson. The New York City official and potential mayoral candidate voiced his strident opposition to tolls and again called attention to his plan to drastically increase driver licensing fees. Again, this is a perfect example of a politician putting forward a plan that would have a disproportionate impact on those who can least afford it without creating a true distribution of responsibility for the MTA’s financial picture based on use of bridges, roads and rails. Finally, we have State Senator Malcolm Smith. The Senate Majority Leader is wavering on the toll plan. He doesn’t understand how the MTA, behind Richard Ravitch’s suggestions, could go from needing a $5 toll to suddenly being satisfied with a $2 toll. As a result, he has called for and gotten the go ahead to conduct at MTA audit. It’s doubtful that the MTA audit will be completed in three weeks and a day, and the answer to his quandary is simple really. The MTA knows that its best hope politically is a $2 toll. Some of the money they need is again far more preferable to none. In the middle of this imperfect storm is Richard Ravitch. He is the subject of a sympathetic profile by Sam Roberts in The Times today. Everyone loves him; everyone — from Silver on down — trusts him; and yet politicians are still hung up a six-year-old bookkeeping scandal that was perpetrated by a bunch of people no longer in charge. Old stereotypes and prejudices die hard, and while the battle lines are drawn, Ravitch will have to help guide the proper pieces into position. New York City is depending on it. It’s fairly ironic that Sheldon Silver, New York State Assembly speaker, is earning kudos for his brave step in embracing East River Bridge tolls to save the MTA. A little less than a year ago, transit-watchers were railing on Silver for quashing congestion pricing in committee, and had Silver seen Mayor Bloomberg’s plan through the Assembly, the MTA wouldn’t be in nearly as dire financial straits as it is today. But for now, we’ll have to let congestion pricing bygones be bygones. The MTA needs this bailout, and based on the misguided opposition of State Senate Democrats and illogical rumblings from Marty Markowitz, Silver and his proponents have an uphill battle. On the lower East Side, represented by Speaker Sheldon Silver, 82% of households do not own cars and more than half the commuters take mass transit to work. 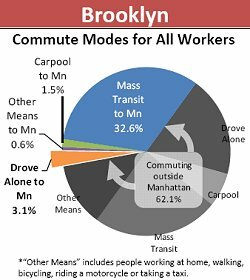 Across the river, in Williamsburg and Bushwick, represented by Assemblyman Vito Lopez, three-quarters of the households don’t own cars and less than 2% drive to work. Even so, it took until last night for Silver to float a sketch of a plan for scaled-down tolls, and Lopez has trashed tolls. You’d expect better from pols with districts that would be hammered by service cuts. Silver’s constituents would lose the W line and get fewer trains on 10 other lines. Three bus routes (M6, B39 and X25) would be dumped, and others would have weekend and night service service chopped. Lopez’s district would lose the Z train and get fewer runs on the M, J and L. The B39 bus would vanish, and weekend and night service on other lines would be wiped out. The transportation patterns are similar in legislative districts across the city. Lawmakers must come to their senses and protect the well-being of the bulk of their constituents with properly funded mass transit. To reject tolls without a smart alternative would betray the greater good. Today, The Times opines in favor of the Silver plan as well. Like the News, the Gray Lady’s editorial board is less than thrilled with the watered down version of the plan but sees it as the MTA’s last hope. While recognizing that Silver is “probably the only one in Albany with enough clout to sell such a compromise,” the paper calls his efforts to deliver this toll “mak[ing] amends” for killing congestion pricing. At this point, it doesn’t matter how it gets done or who does it. It doesn’t matter what Silver did ten months ago or how he’ll feel ten months from now. If he is the one with the political will to save the MTA, we’ll have to hope for the best. MTA officials know that Silver’s plan won’t go far enough, but that’s a bridge we’ll have to cross after we toll it. Just a day after Albany promised fast action on the MTA’s financial situation, proposals are making their ways through the Senate and Assembly. While Assembly Speaker Sheldon Silver is primed to endorse a modified East River Bridge toll plan in the Assembly, Senate leaders from the New York City area have yet to embrace the plan, leaving the MTA’s financial future in doubt. Silver’s proposal, while a start, would set initial toll levels at $2 a ride, on par with subway fare but well below the figure set forward by Richard Ravitch. In other words, Silver’s plan would probably be the worst of all worlds. The MTA would still need to raise fares and cut services to cover its deficit, and politicians would be up in arms over tolling. If that’s all he thinks he can deliver, so be it. It is, as some opposing Assemblymen noted, far easier to raise the tolls later on than it is to get them implemented in the first place. Meanwhile, in the Senate, Outer Borough representatives are spinning the same old tired rhetoric as they oppose all tolling plans at the expense of the MTA. If that is in there, there’s no way I’m going to vote for it and you can take that to the bank,” Ruben Diaz, Sr., a State Senator from the Bronx, said. Do these politicians not realize that far more of their constituents will suffer if the MTA enacts its Doomsday budget than if tolls arrive on East River crossings? As that chart at right shows, only about five percent of all Manhattna-bound commuters from Brooklyn cross the bridges each day while over 32 percent rely on the subway. The numbers are substantially similar for the Bronx and Queens. Yet politicians are willing to sacrifice the subways for their precious free bridges that should be tolled anyway. Furthermore, nearly as many Manhattan-based commuters used the bridges too. While these politicians are claiming that this plan penalizes the Outer Boroughs, that cry is far from the truth. In the end, Kellner’s point of view will have to win the day. One way or another, the Assembly and the Senate are going to have to pay for the MTA. How they do so remains to be seen. When New York State elected Eliot Spitzer as governor, transit advocates had high hopes for the future. Spitzer, a New York City native, seemed to understand just how important sensible transit policy and funding would be to the future of the city and state. Spitzer, however, met an inglorious end, and with him died the hopes of many. Now, the state is stuck with an unpopular governor who is trying to stave off financial disaster. Yesterday, on a rather pessimistic day for the MTA, David Paterson threw what political weight he has behind the financially beleaguered transit authority. In a statement, Paterson urged immediate action from Albany for the MTA. This week I asked Richard Ravitch, Chairman of the Commission on Metropolitan Transportation Authority (MTA) Financing, to come to Albany to advance my goal of enacting the recommendations outlined in the final Ravitch Commission report. This proposal is critically important to the people of New York. The fare increases and service cuts that will happen without this legislation will do further damage to our fragile economy and bring added financial strain to New Yorkers already suffering during this economic downturn. I have discussed this with the Legislative leaders, and they agree that this must be addressed before our final budget deliberations are underway. To this end, the Senate and Assembly have scheduled conferences for tomorrow to discuss this MTA issue. The time to do this is now. These Ravitch Committee recommendations have the support of business and labor, civic groups and straphangers. I will speak with lawmakers who have any doubt about the critical nature of this issue, and have asked Mr. Ravitch to remain in Albany tomorrow to hold further discussions and bring this process to a close. We must get a final agreement in place within the next week. MTA Chairman Dale Hemmerdinger ended his day of lobbying state lawmakers on Richard Ravitch’s tax-and-toll bailout plan much the same way he started it: Completely unsure whether it will pass in time to stave off massive fare hikes and service cuts. On the Assembly side, Sheldon Silver, seemingly suffering from multiple-personality disorder when it comes to transit, couldn’t even commit to a timetable as Smith did. He again called the cuts “unacceptable” but wouldn’t reveal alternative plans or a timetable for a bailout. With exactly one month to go before the MTA Board must vote on the Doomsday budget, the clock’s a-tickin’ ever closer to midnight. Things are not looking good for the MTA. With just 40 days left until the MTA Board is set to vote on a draconian package of service cuts and a fare hike, the prospects for a Richard Ravitch-inspired bailout are growing dimmer and dimmer. When Richard Ravitch revealed his financial rescue plan for the Metropolitan Transportation Authority in December, the harshest criticism focused on a proposal to place tolls on the East River and Harlem River Bridges. That made the plan’s centerpiece, a proposed new tax on payrolls in the 12 counties served by the authority, seem painless by comparison. But since then, resistance to the payroll tax, which would raise $1.5 billion a year, has been building, especially in areas farther from New York City with less access to mass transit. And opposition is coming not just from businesses that would pay the tax but also from public officials worried about schools and health care. That is because the tax envisioned by Mr. Ravitch, 33 cents on every $100 in salaries and wages, would apply equally to private businesses, nonprofit organizations and government agencies, including school districts. The flip side to this, of course, is that the economy will suffer a far more drastic downturn without this tax than with it. Transit will become a problem rather than a integral part of a commute. The region — known for relatively speedy access from suburbs to the economic hub of New York City — will suffer. Property values will go down; wages will go down; productivity will go down. Those schools will lose a lot more as people’s tax burden drops than they will under the Ravitch plan. It all sounds very doom-and-gloom, but that’s reality. Still, no one in the government is putting it that way. Gov. David Paterson keeps talking about an upcoming push to support the plan, and I hope that enough New York City representatives can garner the support needed to pass it. We can’t afford not to bail out the MTA, and no one knows that more than Richard Ravitch himself. Facing big deficits, the Metropolitan Transportation Authority is threatening big fare increases — from $2 to $3 for a subway ride, for instance — for everyone who uses public transit. Gov. David Paterson and other politicians are trying to head this off, or reduce the pain. Here’s one suggestion: Ask drivers to start paying tolls on the bridges that cross the Harlem and East Rivers. Just about every commuter pays a fee of some sort — except for drivers who use those bridges. This is manifestly unfair to millions of others who take the bus, subway or railroad in this area to get to work. Charging drivers their fair share was an important part of proposals offered last year by a commission led by Richard Ravitch, who once ran the authority. To put the entire system on a stronger financial footing, and to avoid both drastic fare increases and service cuts, the commission’s plan required contributions from riders, businesses and people who drive cars. Riders would endure a modest increase in the cost of their trips. Businesses, governments and unions in the 12-county area around New York City would do their part with a modest tax per employee. And drivers would start paying new bridge tolls. The paper of record urges Mayor Bloomberg to voice unconditional support because the East River tolls can help him achieve his congestion-cutting goals. It also urges Sheldon Silver and David Paterson to throw their voices behind this plan. It may not be the most popular path, but it is the one the city as a whole needs to support both its economy and its mass transit system. With the MTA’s financial future on the line, the Ravtich Recommendations are an important set of measures various state agencies can implement. While the city will eventually have to decide on the East River bridge toll centerpiece, the state senate seems to be doing its part to bail out the MTA. Senate Democrats are ready to support a new payroll tax to help rescue the MTA. Majority Leader Malcolm Smith, who previously opposed imposing new taxes, said Democrats would support the proposed tax if the business community agrees to it. “It’s really the last thing we want to take a look at, however, this is a classic example, I think, of shared sacrifice,” Smith said Thursday. The tax of one-third of 1% is a key component of the financial bailout plan crafted by former MTA Chairman Richard Ravitch. It would affect payrolls in New York City and the other counties the MTA serves. Smith noted that most business groups, including the Partnership for New York City, have expressed support for the tax. Ravitch’s plan, which has the support of Gov. Paterson, is intended to plug the MTA’s $1.2 billion budget gap and head off draconian fare hikes and service cuts. According to Blain, Ravitch journeyed up to Albany to meet with State Senate leaders this week. Over the next month, in advance of the MTA’s March 25th drop-dead date, two State Senate committees will hold joint hearings on the Ravitch recommendations. Time is clearly of the essence. Meanwhile, for MTA watchers, this development is clearly good news. If Albany passes half of the Ravitch-inspired bailout plan, the focus — and pressure — will shift to the city. Council members will face increased pressure to approve either the East River bridge tolls or some form of monetary relief — car licensing fees, congestion pricing — for the MTA. Our transit system might just be saved yet.